We don't keep anything on the property that isn't a nice, well broke and well trained horse. 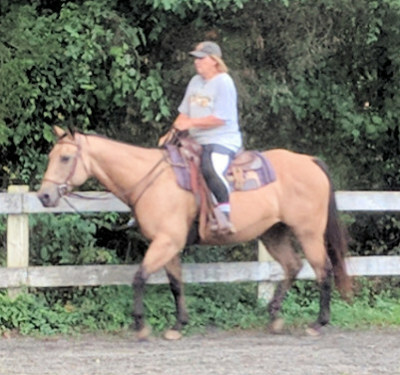 We like getting in new horses and working with them, it's good experience for our more advanced riders and Kandi still loves to work with greener horses... even at 72 she is still a horse trainer at heart. That being said, if they are suitable in temperament for her to ride at her age, they are suitable for most other riders. We usually have a few really nice horses for sale or lease. Both Kandi and Tammy love to buy horses, so if we bring in something new, something has to go or we are bursing at the seams in a year. What we sell are horses we just don't use as much for a variety of reasons, mostly because we have enough horses in that level to meet the needs of our students. For many years we were a successful sale barn with a good reputation for good horses at fair prices that were honestly represented. It finally became too hard to run the lesson and show program and sell horses at the same time, so we aren't a true sale barn any longer. On a much smaller scale, we still take great pride in offering a few great horses a year to new homes. We don't want to see the horse go to a home that isn't going to fit any more than you want a horse that doeesn't fit your needs and you will find our first questions will alway be "What do you want to do with the horse?" and "What type of rider?" Don't try to buy a winning jumper that will carry your 5 year old child! We want to educate and fit horse and rider together. 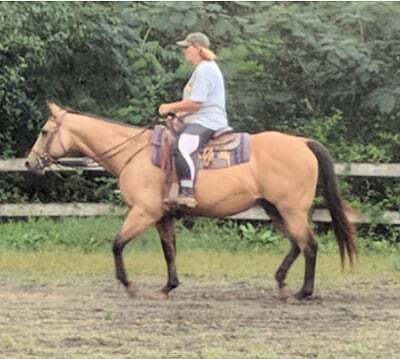 Drop dead gorgeous golden buckskin mare that is close to bombproof. She is stout enough for any rider and just the right size for easy mounting. I was told she had been registered but that the papers were lost. She looks like a quality horse. We've had her about 6 months. I've put a nice western jog on her, dropped her head and got her into shape. She'd been standing for a couple of years, had a foal. Her lope is adequate, good enough for the trail but not polished enough for the ring yet... we're working on that now. 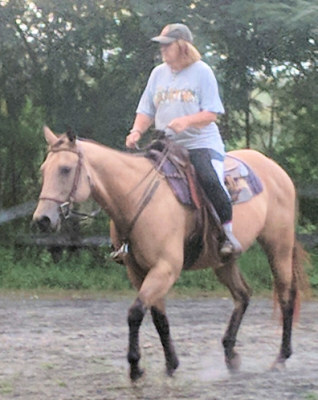 This mare is solid, she's been ridden by a 72 year old woman and has never been anything but respectful. 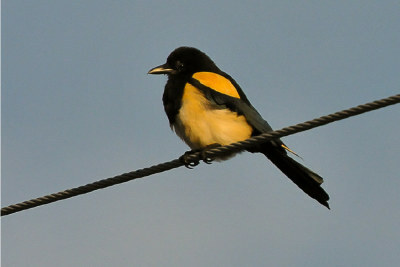 Great on the ground, she is easy to work around and likes people. She rides in the ring or on the trail. No vices, no spook, buck or rear. Stands for mounting. Gets along with any horse in pasture or on the trail. 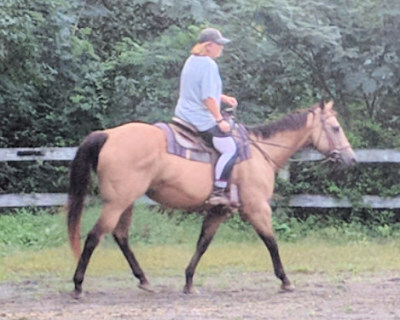 I like this mare a lot and would love to keep her, but we don't have lessons that fit her and we have a strict rule about keeping too many personal horses. This guy was KY bred and was used as a pony horse at Churchill Downs so he's been there and done that. Pretty mover with a natural head carriage, we've shown him lightly. He's the same in the ring as he is at home and he's been consisntently in the ribbons. Jumps 2'6" and he's a packer. Gives lessons, shows, goes on trails. We just don't need him as we have several lesson horses in that range. Sound but he is a light cribber and needs a collar if he is stalled. If he didn't crib he'd be $10,000 because he's a packer with a lot of style. 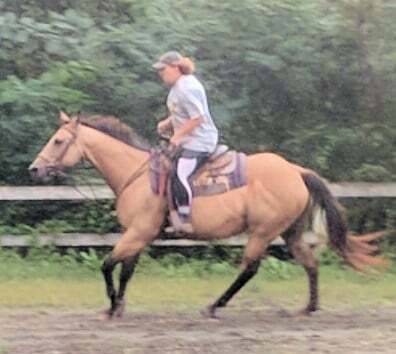 We need to get fresh pictures and video but our ground has been so muddy and the horses so furry, we're waiting for spring or the indoor to be finished, whichever comes first!